Walk 20: Trail to Yuemeikang Waterfall. I was there on Sun 16th Sep. 2012 and reached the waterfall with no problem. PS. The ‘indistinct trail’ to the left after the zig zag section is now clearly signposted in a “gold” sign. Thanks for the info. I’d heard that the last part of the trail up to the waterfall had been washed out. Good to hear it’s still OK. The waterfall has been well-and-truly ‘discovered’ during the last two years (which is why I put it in the book), and the quality of the trail to the fall has improved quite a bit, as you say, with a clear signpost now; thanks for the feedback! Hallo Richard, Thanks for all the great books. We use them constantly and have done quite a lot of all the hikes from Taipei Escapes to Yangmingshan and they always guided us well. Unfortunately, one of our friends in possession of Taipei Escapes 1 has gone back home and took the book with him. So I tried to pick up a copy for myself (I already have Escapes 2 and guide to yangmingshan), but it seems that the book is not available anymore at eslite or via internet. Do you have any good idea where I could find one? Thanks for writing; glad you like the books! Surprised to hear they’re not at Eslite; the smaller branches often don’t have them, but they should be at larger branches. Failing that Caves bookshop (in ZHongshan North Road near Yuanshan MRT and in Tianmu) always has a stock and Page One in Taipei 101 is reliable as well. Hope you pick one up OK! I am visiting Taipei for a couple of weeks in May and would be interested in doing some one-day hikes around the area. Your books and the previous ones you published seem a very good option for me. If had to buy only one book for this visit, which own would you recommend me to buy? I am looking for those trails more accessible with public transportation and not too demanding in terms of stamina (4-6 h round trip). Hi Enric, thanks for the interest in the books! Taipei Escapes I and II both have quite a few easier hikes in them. Taipei Escapes II however has more hikes immediately around Taipei, including some reachable on the city metro system, so that might be the one to go for. Hope you have a great time in Taipei! 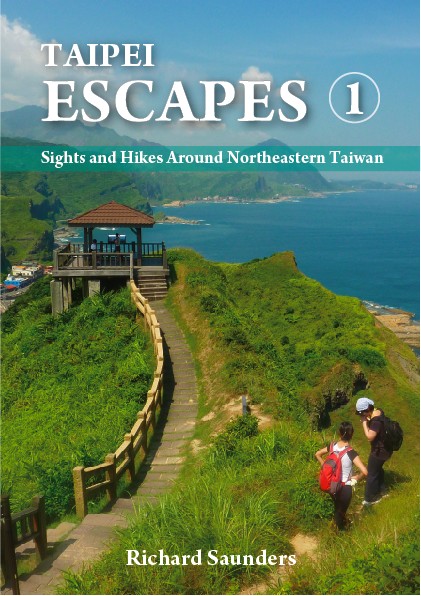 Your books Taipei Escapes seem amazing! Where are precisely located the librairies which sell them ? Is there any at the airport (where it would be very easy to find it !!!) Thanks a lot in advance ! Hi Big Jay! Thanks – glad you like the look of the books so far! The books should be available in bookshops in Taipei, although availability has been patchy recently. If you’re willing to have them sent to you, they can be bought online through the Community Services Center, here in Taipei. Send them an email at: csc@communitycenter.org.tw .